Animal Tracks by Arthur Dorros – We read, “Animal Tracks” together. Although she was focused and listening at the beginning, she lost her focus as the book was longer than most books she is used to. So instead of continuing to read, we looked at all the pictures. The front and back of this book has pictures of tracks made by different animals. We took a close look at these pages and I named the animals for her. 1. Quiet Time Poem – I first read the poem aloud and demonstrated the actions to R. During the second read, I made R do the actions with me by guiding her arms and body. We repeated this a number of times and she always giggled when crouching down at the very end. I then said the poem again and had her do the actions on her own while I did them along with her. Next, I read the poem aloud a number of times while pointing to each magnetic foam animal. When R and I did the poem together, I would hand her one foam animal at a time and she would stick it onto the fridge for me. a. Older children can make their own foam animals for this fun puppet play poem. b. Have the child demonstrate animal recognition. I asked R to hand me one animal at a time at random. The first time she did this, she handed the correct animals to me. The few times after it was hit or miss. So, we can’t be certain if she does recognize all 8 animals yet. I’ll try this again in the future and make note of her progress. 2. 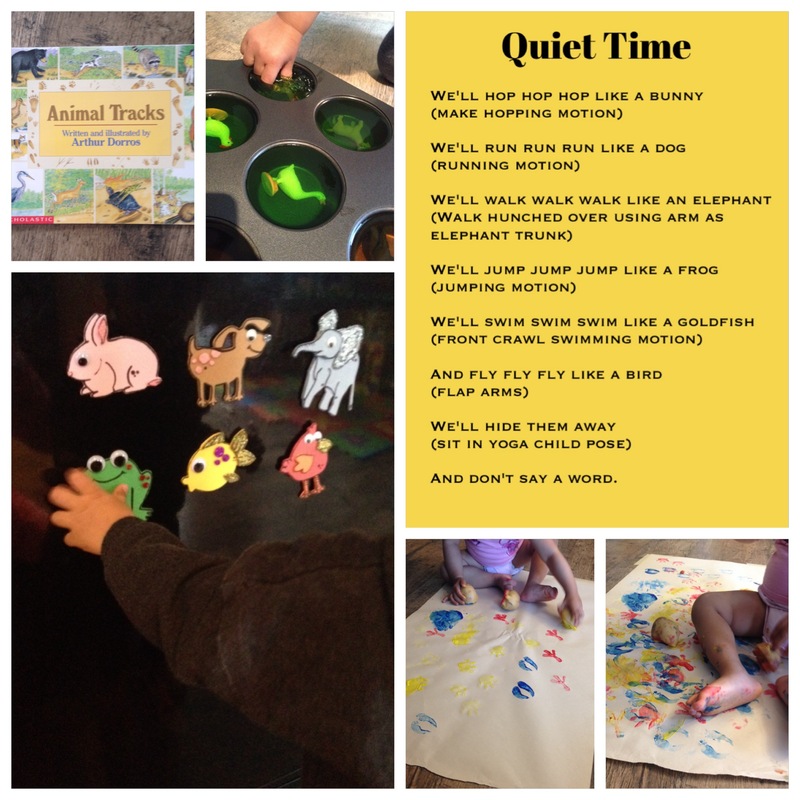 Jelly-ed Animals – While R took her afternoon nap, I prepped this activity. I made jello as per the directions on the package and poured it into a muffin tin. To each section, I added one of R’s farm animals. Once it was time to play, the jello had set wonderfully! R loved digging the animals out of the cool jello so much that she was drooling excessively! I named all the animals for her as she dug them out. a. Hunt for Animals. Ask the child to dig out a specific animal and see if s/he can correctly do so. b. Set up a wash basin next to the muffin tin to give the animals a bath as they are pulled out. 3. Animal Tracks – We made animal tracks together using potatoes I had carved that were dipped in red, blue and yellow paint. R initially rubbed the potato across the page, but after a few demonstrations, she understood the concept of stamping. a. Name the animal. Challenge your child to match the stamped tracks to the ones in the “Animal Tracks” book to discover who they belong to. b. Older children can label the animal tracks with the name of the corresponding animal.